Prvi Partizan is a Serbian company that is well-known for producing ammunition in accordance with modern standards while also maintaining a healthy supply of obscure loads to feed all of the C&R rifles on the market. 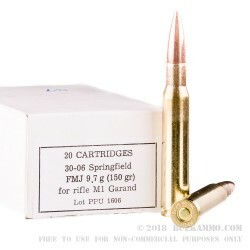 This particular .30-06 Springfield offering is made specifically for use with surplus M1 Garand rifles and features a specific load of powder that is more closely matched to original military rounds than the hotter and more powerful hunting and sporting loads that are manufactured today. 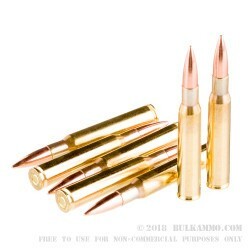 As a result, M1 collectors can fire these rounds without worry of bending their operating rods or endangering other parts that may be difficult and expensive to replace. 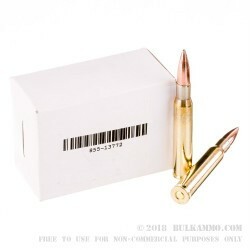 Each cartridge is made using a reloadable brass casing that has been heat-treated at the neck and shoulder to prevent case splitting and promote longevity during reuse. The case has non-corrosive Boxer primer at its base that won't pollute your rifle's gas system or mar its breech face. 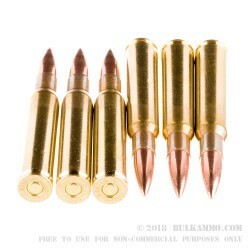 Topping off the casing is a 150-grain full metal jacket (FMJ) projectile that is free of steel and can generally be fired at most indoor and outdoor ranges. The FMJ will feed smoothly and is ideal for use at CMP matches or for general plinking while introducing friends and family to one of America's most beloved rifles.